Cliff’s conclusion is also echoed in a recent RAND report, ‘The US China Military Scorecard,’  which argues that China is catching up to the US, is becoming more assertive and confident, and has geography on its side. The report notes that ‘China [has been able] to narrow the military gap in almost every area and move ahead in some’ and that the ‘overall capability trend lines are moving against the United States.’ The report also highlights the speed of change in China’s military: it’s pushing forward in key capability areas and its modernisation is occurring more rapidly than that of the US. China is leapfrogging, whilst the US is plodding. These two accounts suggest worrying trends and highlight that an analysis of the PLA which is based on superficial glimpses of selected areas of capability misses the bigger picture. The speed of China’s military modernisation, its sustained investment in terms of double-digit spending levels, and the types of capabilities it is acquiring highlight China’s strategic objective of eroding America’s military–technological advantage so that Beijing may resolve territorial disputes and ensure the success of the China Dream. Even though China does face real domestic challenges, so does the US in the form of growing national debt and destructive political partisanship in Washington that together reduces its ability to sustain defence spending  in coming years to offset Chinese capability growth. That’s occurring as security risks in Europe  and the Middle East  multiply to impose greater burdens on shrinking forces . The end result is reduced US readiness and overall effectiveness at a critical time later this decade. Paul’s dismissal of PLA capabilities seems to lack operational context and overlook PLA capabilities now in service. A key emerging issue is the survivability of naval surface forces  in the face of PLA A2AD capabilities. Here PLA ability to wage information warfare against vital US C4ISR networks through counter-space operations with ASATs, integrated network-electronic warfare (INEW), and cyber warfare need to be considered more deeply as winning the information battle  against China is vital to countering their A2AD capabilities. The RAND report notes that Chinese offensive counter-space capability, for example, is growing faster than the US defensive counter-space options. There may be technological silver bullets to mitigate such developments but they must first be funded through to operational status, and then proven to work in battle. While Paul is certainly correct to suggest that the US isn’t ‘sitting on its hands’ as its ‘Third Offset’  strategy clearly demonstrates, this argument can also be reversed. China has flown hypersonic glide vehicles , is deploying counter-stealth radars , and has the world’s largest unmanned air vehicle  capability. China is catching up in anti-submarine warfare, with the deployment of fixed acoustic arrays  and Jingdao class ASW corvettes , as well as new maritime patrol aircraft. In air defence, China will likely acquire the S-400 SAM  which is effective against stealth aircraft, and long-range air combat capabilities epitomised by the J-20  can exploit the US reliance on forward-deployed AEW&C and airborne refuelling aircraft  to further reduce US ability to project airpower. In terms of submarine quieting, nuclear submarines are always going to be noisier than conventional boats. 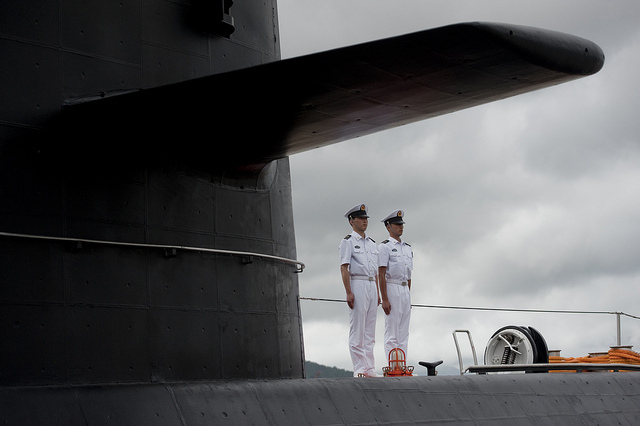 China deploys both the Yuan and Kilo 636 conventional submarines  which are very quiet and difficult to detect in acoustically challenging waters in the South China Sea. The RAND report notes that ‘China’s newer submarines are becoming quieter and better armed, and there is every reason to believe that their capability to find and attack US surface ships has vastly improved [since 1996].’ It is the ability of these boats to fire long-range supersonic anti-ship cruise missiles (ASCMs), such as the new 290nm range YJ-18, that according to Andrew Erickson allow China to ‘out-stick’  the US in long-range anti-surface warfare. This submarine-ASCM combination is quite deadly. Paul Dibb is correct to caution against seeing the PLA as ten feet tall, but it would be equally unwise to dismiss China as inconsequential in military-technological terms. China is rapidly catching up, and what matters is where the PLA goes from here, and how Beijing uses its growing military power across Asia. Malcolm Davis is assistant professor in International Relations and post-doctoral research fellow in China-Western Relations at Bond University. Image courtesy of Flickr user Chairman of the Joint Chiefs of Staff.